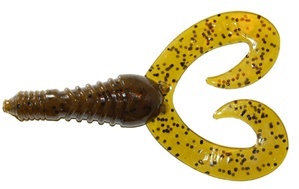 The Twin Tail Craw Grub is an excellent option on the back of a jig. The two grub tails provide irresistable action when moving through the water. A perfect fit for the Gambler Southern Swim Jig. Can also be Texas Rigged and punched through vegitation. Enhanced with Gambler BITE so fish hold on longer. 10 per pack.